The Gulls closed their youth academy and began sharing their training ground with Plymouth Argyle's youth team. However, the club have remained fully professional. Since Nicholson took over, they have won only one league game and are second from bottom of the National League, a predicament he partly blames on Cox, who is now in charge at Barrow. "The club has a lot of problems due to a very experienced manager blowing his entire budget in one hit, holding back nothing in case of emergency," Nicholson wrote on Facebook. "A lot of them can't afford to put petrol in their cars or pay their rent, never mind live like athletes, and so I've spent way too much time behind the scenes trying to help them out so they can concentrate on football. "That has taken valuable time away from the training pitches which benefits no one." Cox said he had little choice but to spend what was left of Torquay's reduced playing budget. 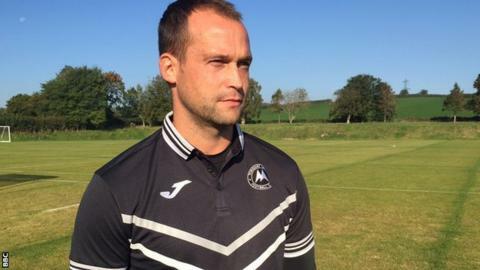 "There was over a third of the budget already accounted for when I came," Cox, who was paid only expenses during he tenure at Plainmoor, told BBC Sport. "There was nothing I could do about that. However, I managed to put together a decent squad which I feel is capable of a mid-table finish. "I sincerely hope that Torquay avoid relegation this season as it is a great football club with an incredible set of fans and I wish them good luck in the future." Earlier this year, Cox's predecessor, Chris Hargreaves, claimed his team earned an average of £375 a week, while the club's former reserve goalkeeper Jordan Seabright left Torquay to become a car salesman in March. A spokesperson for the Department of Business, Innovation and Skills said the government was committed to increasing compliance with minimum wage legislation and enforcement of it. "Whilst we cannot comment on individual cases, the government works to ensure that everyone who is entitled to the National Minimum Wage receives it," the spokesperson said. "HMRC follow up every complaint they receive and have identified well over £3m in pay arrears for over 26,000 workers in 2014-15."